I am back with the second of my Tea Sprays I like using on my hair – Green Tea. I have already mentioned the other tea I like using which is Hibiscus and you can read about my spray recipe here but in case neither Hibiscus nor Green Tea tickles your fancy I have a list of other teas you can use. Green Tea is popular for its health benefits when consumed due to the fact that it is packed with antioxidants that are known to fight free radicals and hinder the production of bacteria internally. Some of the antioxidants in Green Tea are polyphenols,which are said to not only help you attain a healthy body, skin and hair, but are also said to block the growth of cancer cells as well, so drink up ladies & gents! 1 teaspoon Glycerin – 0.1oz (optional – you can substitute this with another moisturizing ingredient mentioned below). *If you are pregnant please do not use EO and consult your Doctor before you decide to use tea on your hair. If Green Tea is new to your routine I would recommend that you make the tea a little “weak” by starting off with 1 tea bag/1 teaspoon so that it is not too strong for your hair. I would also recommend that you rinse it off after application (you can leave it on for 15 – 30 minutes) and space out the applications. This way you can determine if your hair likes the tea and you can increase the amount and strength depending on your hair preferences. While Green Tea is less “potent” than Black Tea, it can still be a little drying therefore, you can add other ingredients to the tea to make it a little more moisturizing. This is why I add glycerin – it is a humectant that draws moisture in the air to the area applied but if your hair does not like glycerin you can substitute it with honey, Aloe Vera Juice, Agave Nectar or omit it completely. My DIY Coffee Infused Grapeseed Oil is great for reducing hair shedding, reducing breakage, it is known to help darken the hair a little and even slowdown premature graying. 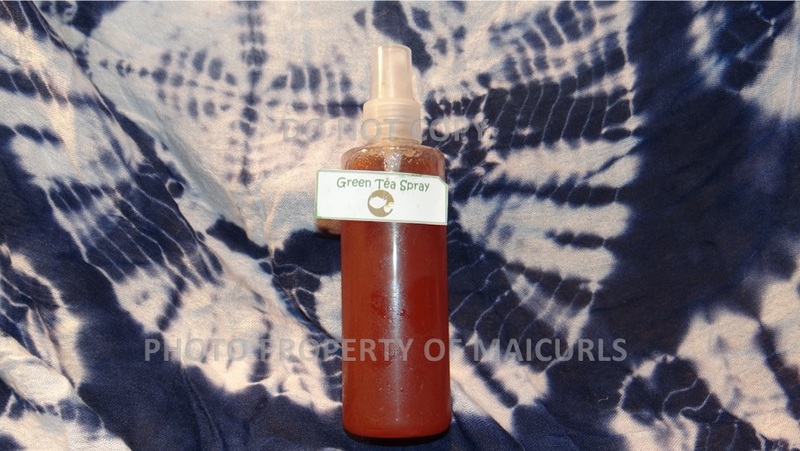 The oil is extremely light and will not weigh down the hair (I have fine hair). I add Peppermint EO because it smells awesome but also because it helps fight dandruff, keeps the scalp clean, stimulate hair growth and helps to slowdown bacterial growth in the tea. Always store the tea in the fridge! All you do is boil the Green Tea bags in the water for no more than 5 minutes on low heat and then allow it to come down to room temperature. Once cooled down add the remaining ingredients (Coffee Infused Grapeseed oil, glycerin and Peppermint EO) and stir really well. Transfer it either into a spray bottle or a container you will use to pour over your hair and you are done. I like using a spray bottle because I can control how much/little is applied instead of pouring the tea all over my hair. I spray my roots (dry or lightly damp hair) and allow it to completely dry without rinsing it off. I store the bottle in my fridge for 1 week and then remake a new batch. While teas are excellent for your hair, too much of a good thing can be bad therefore if this is new to your routine and hair I recommend rinsing out the tea. The information provided is for educational purposes only. I am not a doctor nor a medical professional therefore, please consult with your personal doctor or a medical professional before starting anything new and if you are pregnant always consult your personal doctor or medical professional. Do you use Green Tea for your hair? If so how does it help the overall health of your hair? This entry was posted in Green Tea Tea Spray, Herbal tea rinse, Herbal tea spray, Tea rinse for hair, Tea Spray for hair and tagged Green Tea for hair, Green tea for natural hair, Green tea rinse, Green tea spray, Green Tea tea rinse, Green Tea tea spray, Hibiscus Tea for hair, Hibiscus tea for natural hair, Hibiscus Tea spray, Moisturizing tea spray for hair, Strengthening Tea spray for natural hair, Tea Rinse, Tea rinse for hair on January 13, 2015 by Maicurls. In my video and in the post I mentioned that I leave the green tea on my hair. I suggest for those using tea for the first time to not leave it on just because one needs to find out how your hair responds do it. For some people leaving the tea on without rinsing might be too much and could possibly cause breakage due to the fact that it can leave the hair feeling dry. It depends on your hair needs. Thanks, I did see that in the post. I was kind of just following up on the idea… thanks for expounding. Feels pretty good in my hair for 8-12 hours. Hi dear. I use this and I do not rinse it off with water and leave it to dry. My hair is oily so it does not dry out my hair and it keeps them oil free. I use it 3 times a week after shampooing. Is it OK to do so? I’ve tried it in my hair too because of the great results I had with BTR’S. I also love the Aphogge Green Tea and Keratin Restructurizer spray,have you tried it? Nope, I haven’t tried any of them We don’t have them available locally here in the stores so haven’t had the chance to try them. I will have to make do with my tea sprays lol.